The PHP is a server side scripting language that allows web developers to create dynamic content that interacts with databases. 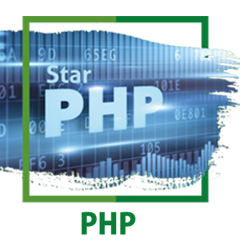 PHP is basically used for developing web based software applications. PHP code embedded into HTML or HTML5 markup or it can be used in combination with various web template systems, web contents management systems and web frameworks. It is integrated with a number of popular databases, including MySQL, PostgreSQL Server etc. PHP supports a large number of major protocols such as POP3, IMAP, and LDAP. Beginner or anyone new to Web Application Development or an Existing Programmer working on some other language but wanting to learn PHP, or a PHP programmer wanting to understand the latest Applications and version of PHP. To understand the general concepts of PHP scripting language for the development of Internet websites. To learn the relationship between the client side and the server side scripts. Use a PHP editing program. Understand the use of PHP with HTML. Understand the ability to post and publish a PHP website. Develop Database connectivity using MySQL. 1. Introduction to Web Application Development with PHP. 2. Getting Started with PHP 7. 4. Implementing oops Concepts in PHP 7. 6. Handling Errors in PHP 7. 7. Handling Dates and Times ‘n PHP7. 8. Implementing MVC With PHP. 9. Testing PHP Based Web applications. 11. Exploring Different PHP Frameworks. 12. Exploring APIs and Rest API’s. 13. Exploring PHP based CMS in the Market.